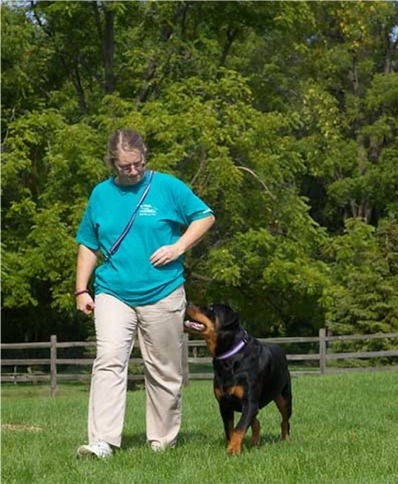 More Rottweiler Training Advice " "
When it comes to Rottweiler training, this dog requires serious and careful obedience training. There is no exception to this rule. You should never try to train this dog on your own unless you have plenty of experience with the breed and the dog you have now isn’t the first one you’ve owned of his kind. Not providing effective training will only result in a dog that is overly aggressive and protective. 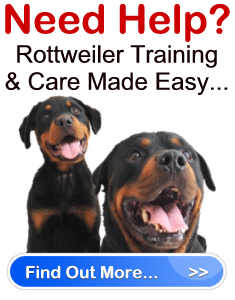 Rottweiler training and socialization should begin at a very earl age when your dog is small, and hasn’t yet established any lasting bad habits that will be hard to break when he becomes older. Although your dog will require serious Rottweiler obedience training, the following is one lesson that should be made a part of your Rotties training. The lesson is how to teach your dog to “Heel”. Step 1 – Put your dog on a leash and take him and the treats outside to a quiet area with few distractions. Step 2 – Have your dog sit directly beside you on your left. He should be facing the same direction you are. Step 3 – Hold the treat in your left hand in front of your dog and give him the command “Heel” and begin to take a few steps forward while keeping the treat in front of your dog so that it is lined up with your left hip. Step 4 – The next part of this Rottweiler training is to have patience. It may take several different tries before your dog will focus his attention on the food. As soon as he does and walks forward, immediately praise him and give him the treat. Step 5 – Continue the lesson but do not give your dog the treat as soon as he walks forward. Try and get him to walk a little further beside you before you praise him and reward him. Remember to always say the command “Heel” before you move forward. Step 6 – When you feel he is ready, attempt the lesson without food and use only the command. Always remember to praise your dog. Keep in mind that all Rottweiler training, regardless if you are in a class or reviewing lessons or teaching him new tricks at home, require patience. Training is an ongoing process that takes plenty of time in order to be successful.